Hiiiiii! I hope everyone is having a fantabulicious weekend. 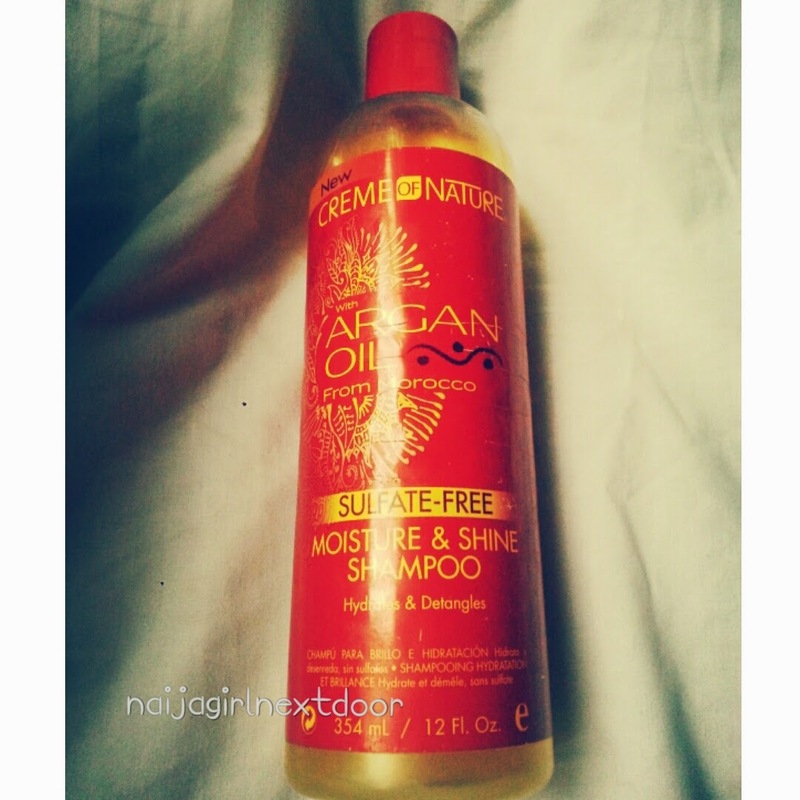 Today I'm reviewing a shampoo, full name: Creme of Nature Moisturise and Shine shampoo with Argan oil From Morocco. I've used it as my only shampoo for months so I'm more than ready to say how it went for me. This one came with a sample of their Argan oil treatment. Price: I got it for N1400 (a little less than $10) from Casabella at The Palms in Lagos, but I've also seen it at Ebeano for N1100. Packaging: 354ml/12 oz squeeze bottle. The label is waterproof and has stayed firmly on. Smell: This smells to me just like detergent, I do not like at all. It lingers for a bit but thankfully not until the next day. Colour and consistency: Golden yellow, pearlescent, somewhat thick so it's easy to control and doesn't make a mess, yet it pours easily. Ingredients: Aqua, Trideceth-7, Carboxylic Acid, Decyl Glucoside, Glycol Stearate, Polyquarternium-10, Argania Spinosa Kernel Oil, Sodium Hydroxide, Disodium EDTA, Quaternium-15, Parfum (Fragrance), Methylparaben, Propylparaben, Methylchloroisothiazolinone, Methylisothiazolinone, CI 14700(Red4), CI19140(Yellow 5). Promises: This sulfate-free formula nourishes and adds brilliant shine, while gently cleansing and detangling. Directions: Apply a generous amount to wet hair and massage into lather. Rinse thoroughly and repeat. 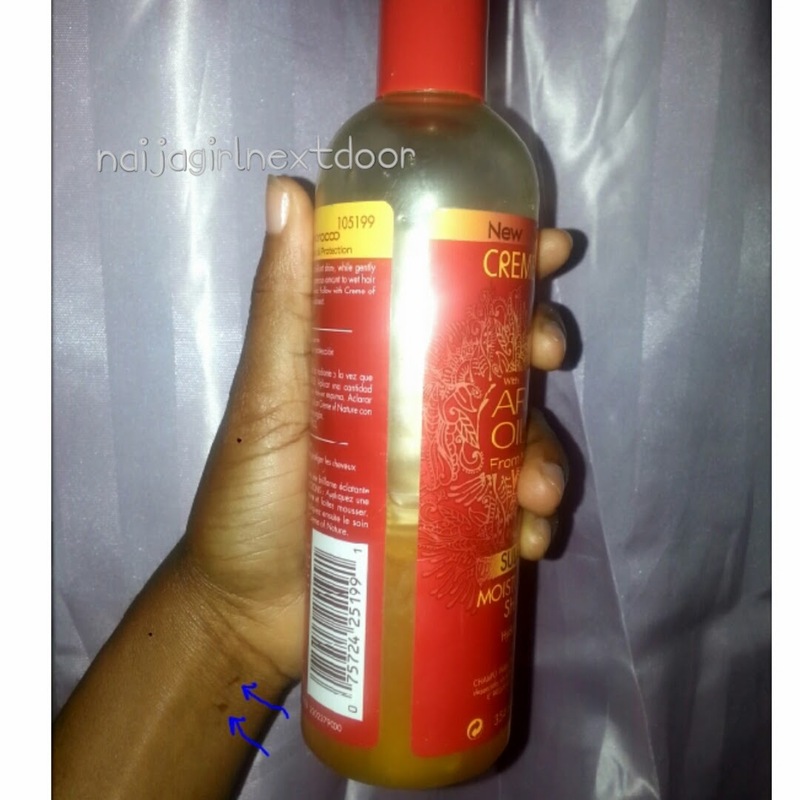 Follow with Creme of Nature with Argan Oil Intensive Conditioning Treatment (I didn't). This shampoo is the best thing I've ever used to wash my hair. Cleansing: I used it undiluted- it lathers a LOT and is so effective that even with the yuckiest buildup, I usually don't need to do a repeat lather. It just melts away the mess and rinses clean but never squeaky. It never leaves my hair feeling stripped even when I lather twice which surprised me, considering all that rich foam. Detangling: They are not kidding about the detangling! In fact I think they didn't play up that part enough. This stuff detangles better than a lot of conditioners. I wash my hair in twists and it as totally unravels them as if they were tangles. The fact that it lets me run my fingers from root to tip while washing is a miracle for my 11-month post relaxer hair. This was my first sulphate-free shampoo and it was a game changer. It leaves my hair so soft and happy that I'm tempted to not condition my hair. Now the oil treatment sample was just ok. It has silicones which coat the hair and make it feel smooth so that's what it did, but I avoid stuff with 'cones. 2. The chemicals in it. Unfortunately that's a deal breaker so I'm saying goodbye. I made a personal decision to cut out all products with chemicals and replace with all-natural ones unless there's absolutely no alternative to be found. There are alternatives to shampoos with chemicals. If you're not finicky abour ingredients you should totally try this shampoo. I predict love. Have you used this before? How did it go? Any natural alternatives you've used successfully (besides black soap)? I'm all ears. Thanks Harlem! Yeah they did a good job with this. If only they would fix that smell.. There's something about this Cream of Nature Argan Oil line. It always gets good reviews and I think I ought to try something, but when I see it at a bss nothing appeals to me. Good review. Happens to me too Aine, 'til date I haven't tried glycerin for the same reason. I like this shampoo and it works really well. My hair is always so smooth after using it. Nice review. Not sure if it's for me but it may work for you. Wow I just read it, thanks for the link Uzo. Fascinating. It may not be sustainable because I'll probably have to make it fresh each time; but knowing me I'll try it and if I like it, it'll pop up every now and then. Nice review. Was jst wondering If you could also do a review of V05 shampoo and conditioner. I know you've used the products before. Thanks for the review! I think I've seen this shampoo around, seeing as you said it detangles and cleanses well it'd probably be something that I'd use, but sparingly because of the smell/chemicals. Hiya mami...I have used this product before tho....It has a not-so-pleasant smell. It's very true a lot of so-called organic brands aren't really organic. I mean look at ORS and their chemicals.